Math. I have found that when people hear that word, they immediately think of another four letter word. They either LOVE it or HATE it. For most that I've talked with there is not much ground in between. I am one of those who loves math. I have 1 child out of 3 who loves math along with me. The other 2 pretty much hate it. I am certain they hate it because they struggle with it and have learning gaps. 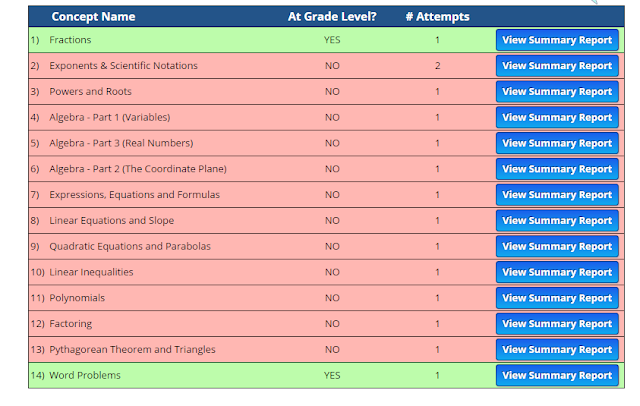 So, when the opportunity came along for us to review the Adaptive Placement Test and Individualized Lesson Plan by A+ Interactive Math, I was excited to see how it worked. Adaptive Placement Test and Individualized Lesson Plan is an online curriculum that can be used with multiple students. It is a simple program to use and has a simple concept. 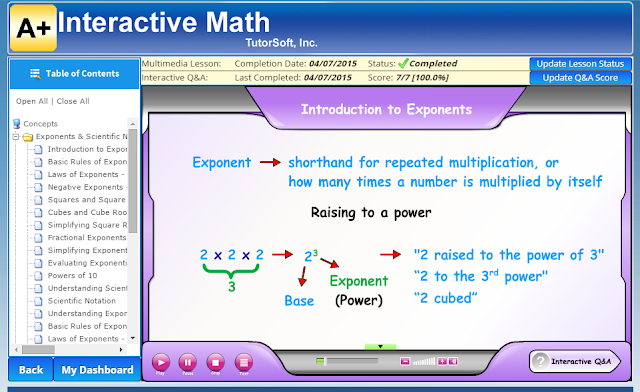 Your student takes a mini test on a major math concept like fractions, addition, multiplication, etc. If they pass the mini test, then they do not have to do any further lessons. 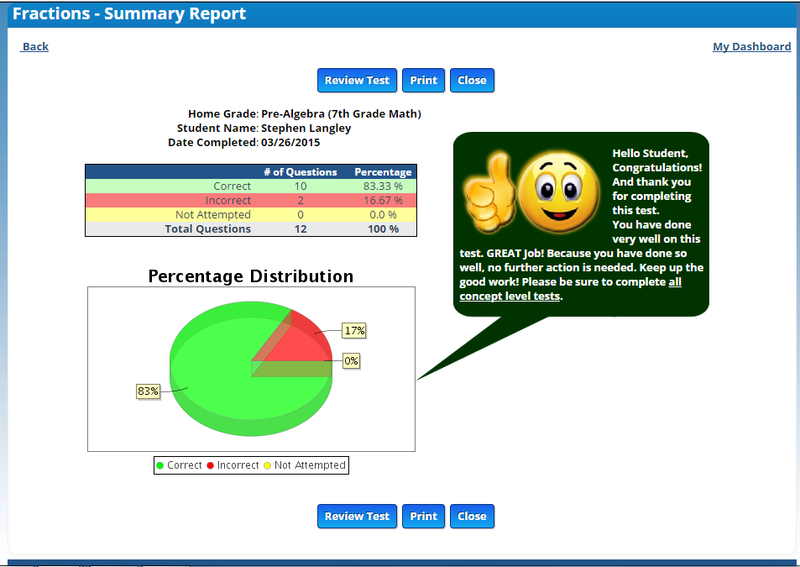 A great feature included are summary reports for both the student and the parent to visually see their progress. If they do not pass the mini test, an individual lesson plan is then automatically set up for them based on the problems they answered incorrectly. Your student will then follow the lesson plan to help them close in on any learning gaps they may have. Simple! 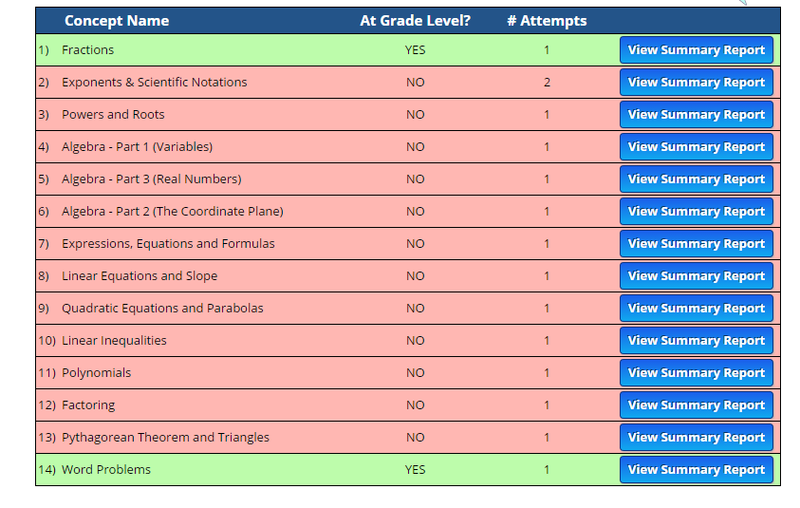 The lessons are also automatically graded for you. The lessons mainly include multiple choice but had some where you type in the correct answer. Here is what the lesson plan section looks like while a lesson being taught. At the end of the lesson is the Interactive question and answer section. There were also online worksheets available that you could complete for even more reinforcement of a concept. The worksheets allowed you the option of completing at your own time and allowed you to see the solutions for each problem. The cost is currently $29.99 for a 3 month subscription for 1 student and goes up $10 for each additional student. I was able to set all 3 of my children up and had them each go through the entire set of mini tests for their level. What we found in the results was pretty much what I had suspected. Each one of them had gaps in different levels. So, I had them work through the lesson plan that was designed for them. Stephen finished one set of lessons but when retaking the concept test, he still didn't pass so he's continuing the lessons with the worksheets this time around. The other 2 are still currently working through their lessons. I emailed A+ Interactive Math to see if there was any way to change the settings concerning my first two cons and I am happy to say that they will be updating these so you can in 4-5 weeks! There Family Math Packages already have this feature. After a student gets an answer incorrect the first time in the lesson, the correct answer is automatically given to them with the solution. My children really wanted a second chance. The online worksheets contained a check answer button and the student could easily hit that, find out the correct answer, type it in and get credit for getting the right answer when in reality they did not solve the problem themselves. So, if you have a sneaky student or one who will cut corners just to "finish" this will definitely not help them. I speak from experience on that one! I also wish there was a way to update the lesson without having to hit an update button at the end. I understand that might be difficult to achieve but having to do that each time was a bit of a nuisance. Currently, you have to do that because there is no way for the program to know if you are done with the worksheets or not if you don't. It was also hard to know exactly where you were in the lesson plan for my children. They had to remember what lessons they had completed already. Once you clicked on the lesson, it did tell you whether or not it had been completed. It would be awesome if some sort of check mark, change or color font, or shading could be added so you know when you are done with a lesson at first glance. Overall, the program is simple to use and will give you an idea what math concepts your child may have learning gaps in and I know that is always a concern for homeschool mamas. Starting May 4th, 2015 through May 18, 2015 there will be a 2-week sale going on. You can save 40% to 50% off on the Family Math Packages and the Adaptive Placement Test and Individualized Lesson Plan programs.